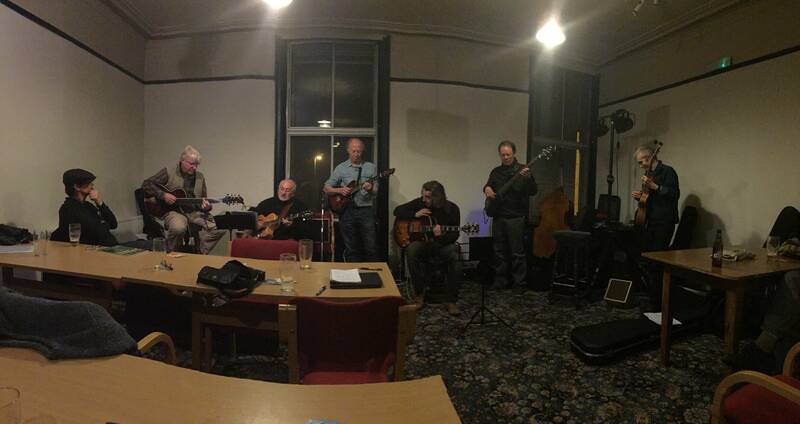 This was a well attended meeting, particularly for the first one of the new year and it was nice to get back to playing after the excesses of the Christmas period. The evening began with Adrian and Darren who played Oh, Lady Be Good by George Gershwin. 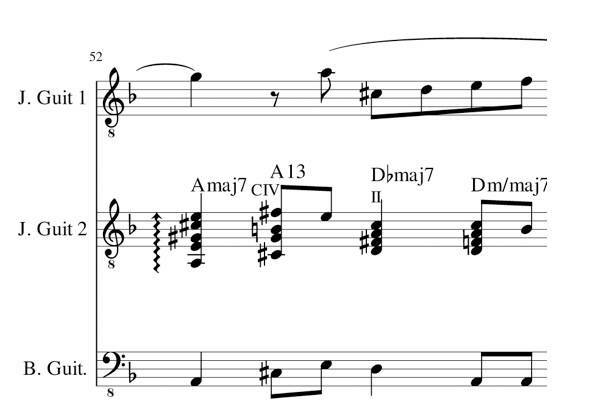 The melody to this was played by Darren, Adrian superimposed the melody to Hackensack by Thelonious Monk which is based on the same chord sequence. The duo followed this with the Parker classic Yardbird Suite. 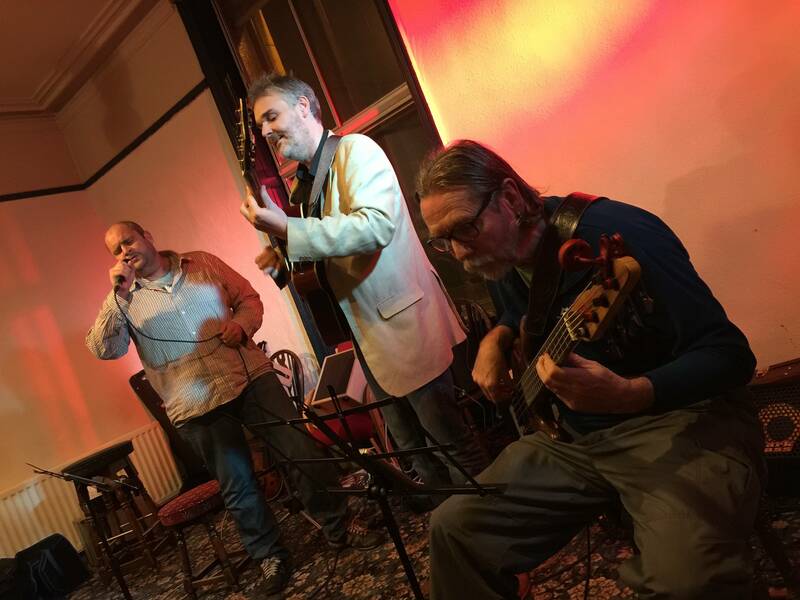 Ben, Dave and Chris followed with Once I Loved by Tom Jobim. This was accomplished as always, with some nice playing from all parties. This was followed by The More I See You, this began with a nice, pedalled introduction before moving into a more regular swing feel. Colin, Charles and Phil were the third group. It was nice to hear Charles play guitar for a change, he normally plays bass. The trio played Moondance. This had a false start duo to a tuning issue but it carried on from where it left off, it was worth stopping as it was much nicer in tune. Jez and Hayden played us into the break. They played the blues classic Freddie Freeloader, a Miles Davis classic from the 1959 album Kind of Blue. After refreshing the drinks and buying/selling a few raffle tickets it was time for the second half to commence. 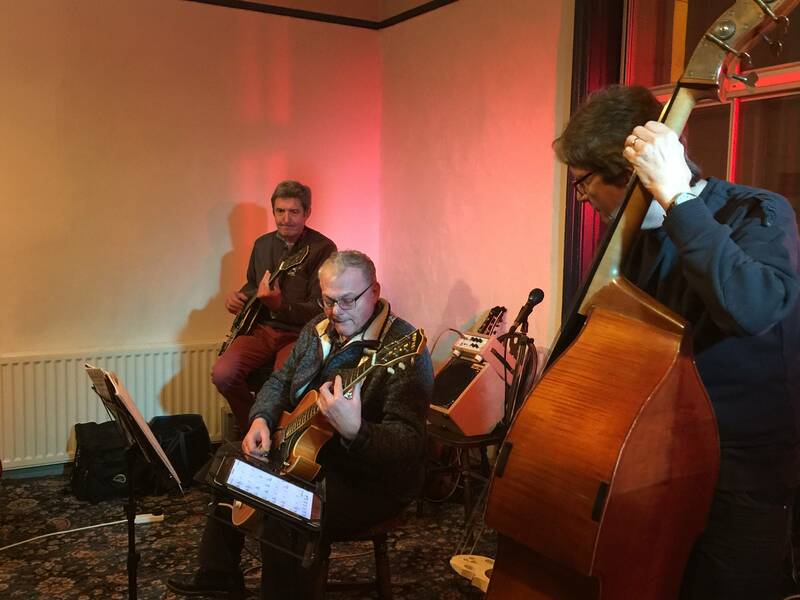 It began with newcomer Paul Wrigley on bass who was joined by Darren and Steve McGuire who sang Fly Me to the Moon. 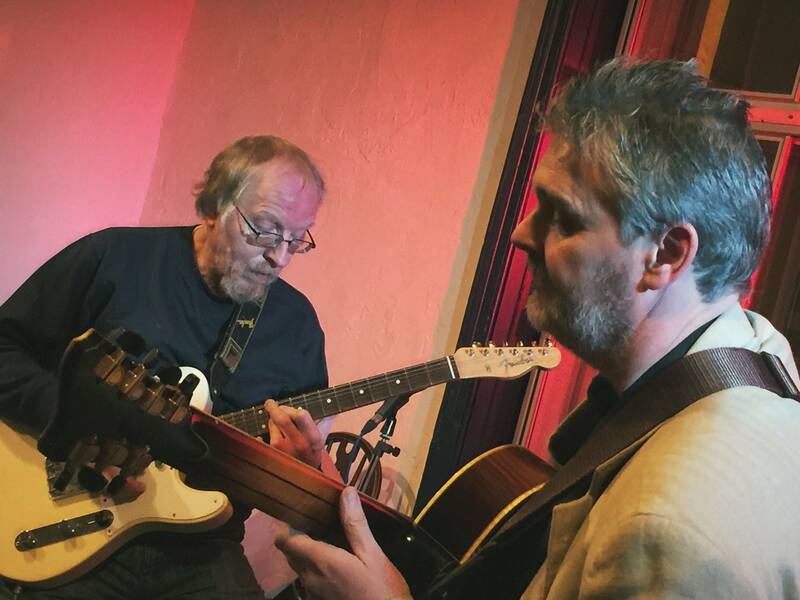 Trefor Owen and Andy Hume joined us from the Cheadle guitar society. They began with Days of Wine and Roses by Henry Mancini. This featured Trefor’s trademark ‘comping’ style, who needs a bass player, its all there. Andy played a delightfully bluesy solo which suited the track really well. The followed this with another Mancini piece, Dreamsville, a lovely ballad which works really well on two guitars. Larry and Ben are an accomplished pairing who play very well together. 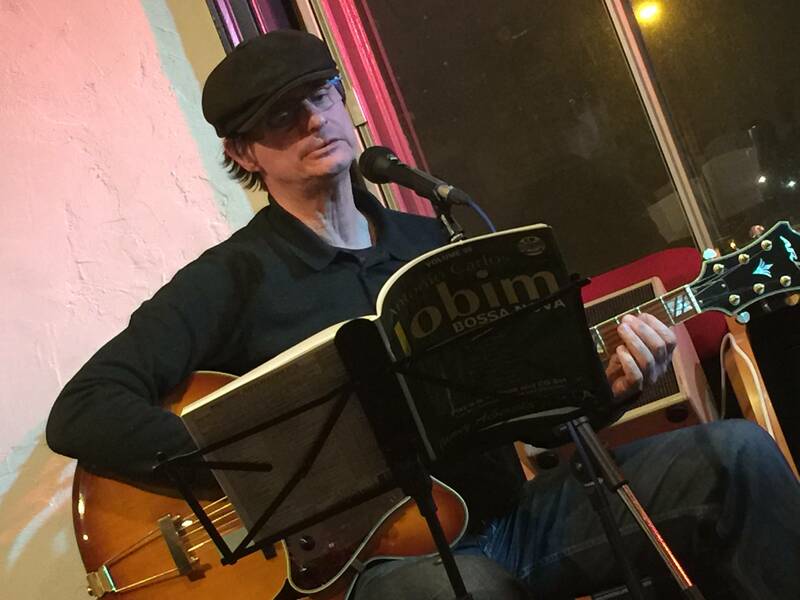 They began with another Jobim classic, Meditation. This featured Larry both singing and playing guitar with Ben supporting on bass. It’s a different tune with some tricky changes but the duo made a good sound. Ben played a particularly nice bass solo. They followed with Fly Me to the Moon which was having its second outing for the evening. 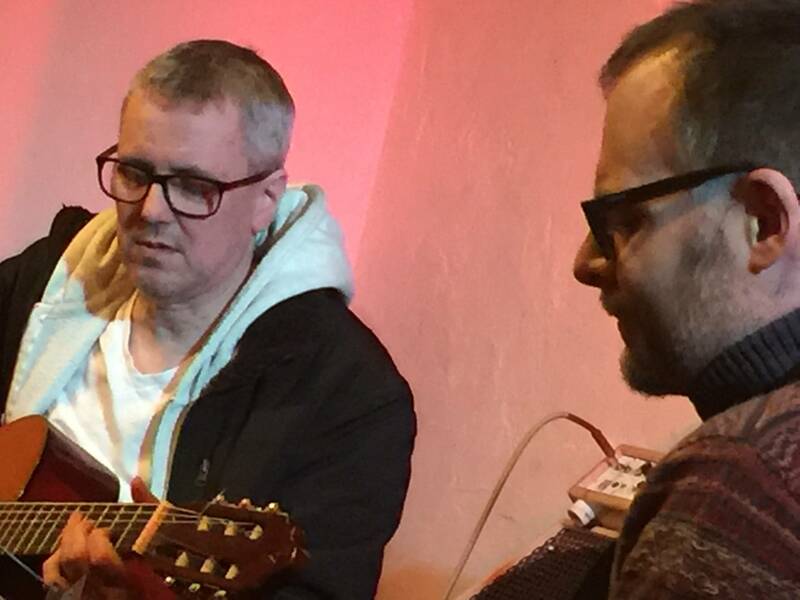 Dave Allen and Paul were the last up before the ensemble jam at the end. They began with the beautiful Bonfa penned classic Gentle Rain. This was a controlled version with some nice playing from both. They followed this with Lover Man. The final jam tune featuring both Dave’s, Paul Chamberlain, Andy, Ian and Chris. Next months tune is My Funny Valentine. An unusual combination you might say which presents some obvious challenges! Fortunately the 3B offer different bass sounds; acoustic double bass, fretless bass and 5 string electric bass plus there are three octaves in terms of register to work with. The first step is to select an appropriate piece that will work with 3B. Learn the tune. Play it, sing it, try it on a different instrument. Make a plan of the arrangement. Balance in the arrangement is vital in terms of dynamics and structure. Don’t write the intro first! Wait! You may come up with an idea as you start to arrange and get to know the tune more analytically. You could use part of the tune or develop an important interval or motif that suggests/ leads us into the first statement of the theme. Is there a way to make the head sound a little different? In the arrangement of Mr P.C. the main theme is played in unison over 3 octaves giving the start some impact. The second time through 2 basses share the theme in 2 different octaves with an extension of the last phrase over a walking bass. The third time through starts with the DB playing the theme with fugal entries using the upward quaver motif. The end of the head section finishes with the last phrase repeated by all 3B and then in unison again for intensity before the solos start with walking bass and chordal accompaniment. The recap of the head at the end of the arrangement does not have to be a straight repeat of the opening and its better to try to put something new in there (or something you develop from the exposition) both for the players and the audience. The DB has the last solo in Nostalgia (accompanied only by the chords, no walking line to change the texture)which leads back to the intro notes. 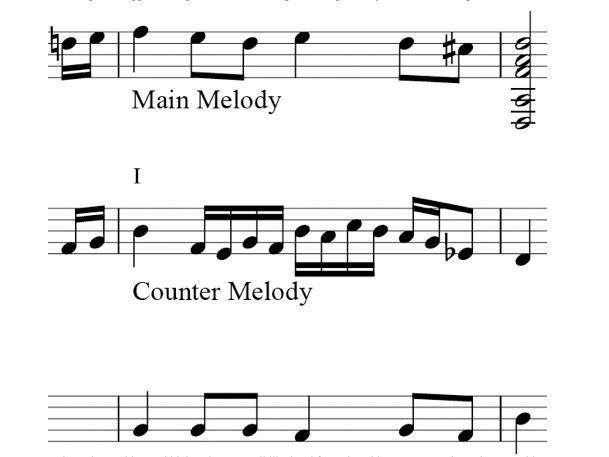 Two basses then trade the theme but finally all three take part of the theme in different registers to emphasize clarity and a unison figure closes out the arrangement. The arranger also has the opportunity to present the piece perhaps with a different time signature! 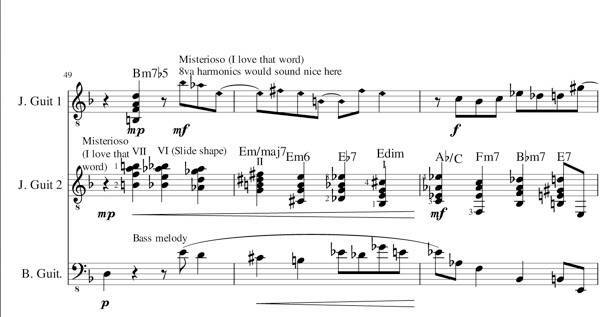 Could 3/4 change to 5/4 , (maybe not for all the piece – do the solos in 3/4). Changing the tempo can also offer a different perspective on a tune. Don’t try to have more than two ideas going at once! (complexity is sometimes confusing). Listeners like consistency but also to be surprised! Having said that don’t be too predictable! As jazz musicians we are arranging every time we play as long as we are responding and listening to our fellow performers. Perhaps it’s a little contradictory to write jazz down but doing an arrangement for a combination of instruments alerts you to the possibilities that can give you more variety and also challenge you to do some different things out of your comfort zone! 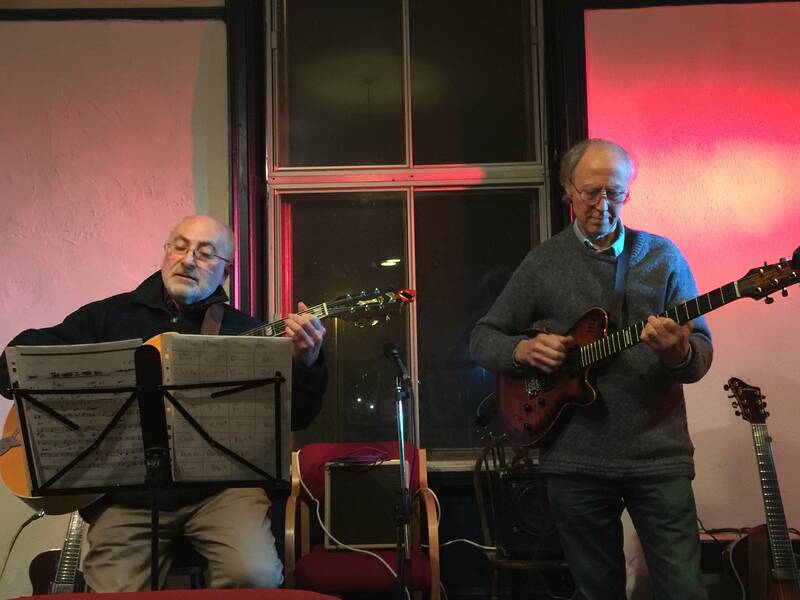 At the December meeting society member Dave Allen produced a rather splendid arrangement of Thelonious Monk’s classic Round Midnight. 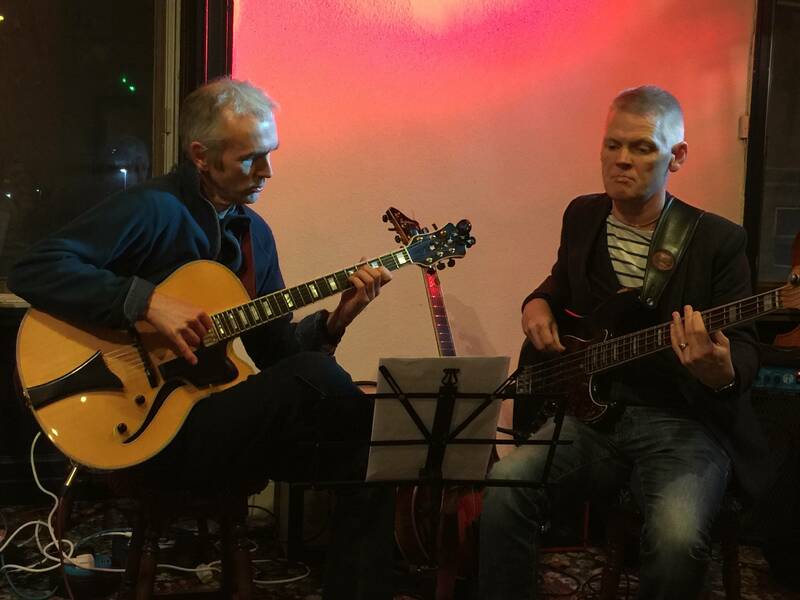 This was performed by Dave, bass player Paul Crompton and guitarist Darren Dutson Bromley. Dave has been very generous allowing us to publish the score and parts and has given us the following accompanying notes on how he created the arrangement. 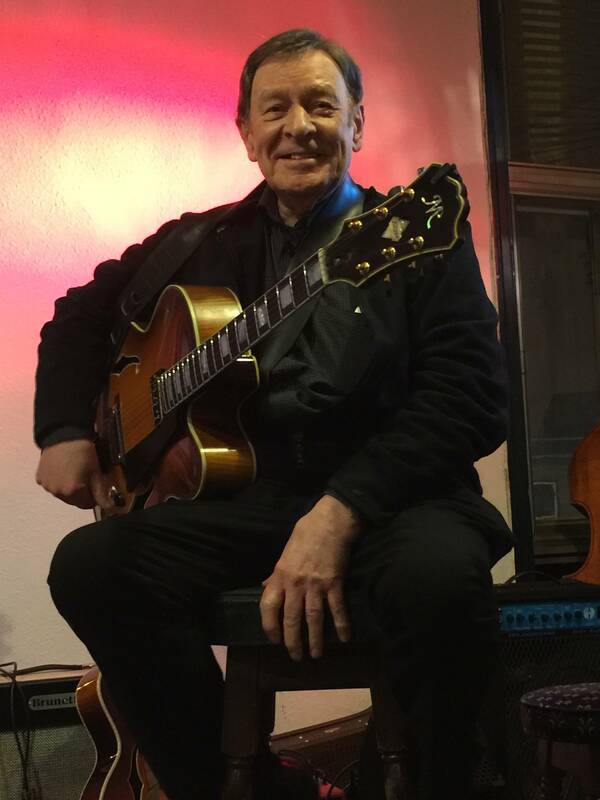 There are also whole tone scale effects, as in the following bass guitar part, and familiar jazz guitar chord sequences/ quotes such as the sequence you may recognize from Joe Pass’s “Days of Wine and Roses” from “Catch Me” album. Use the following button to download the full score and parts.